Dark Forest is a dark 'evergreen tree' type green. That swab looks too teal and has too much blue in there. It's tricky to get them all accurate on this paper. Thanks for the pics Chrissy. I can't say I'm bowled over by any of them yet. Espresso looks interesting but Herbin Cacao du Bresil may be too similar, we'll see. Blood orange also looks promising. Of the previous 150th Anniversary inks, Terracotta was my pick. For me? 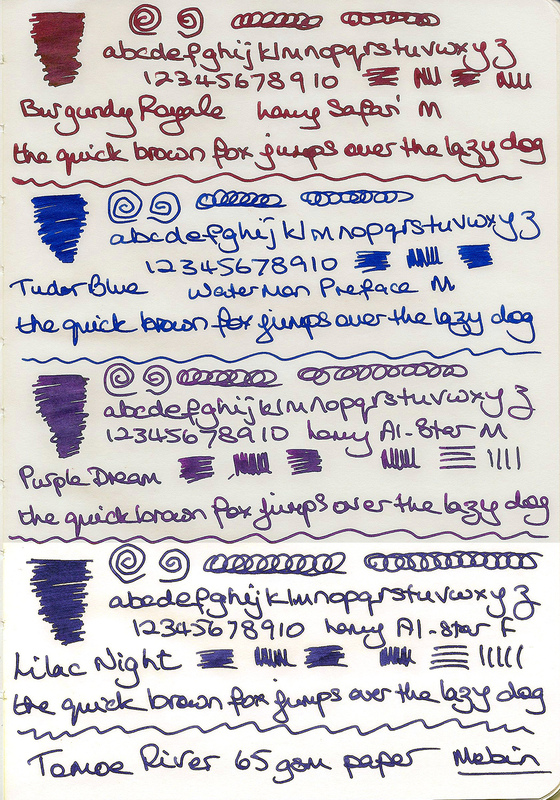 Purple Dream, Lilac Night, (maybe) Espresso, and (absolutely ) Tudor Blue. Okay, yes, I'm predictable -- blue and purple, and a sepia-toned brown. Purple Dream, Lilac Night & Dark Forest also look lovely. 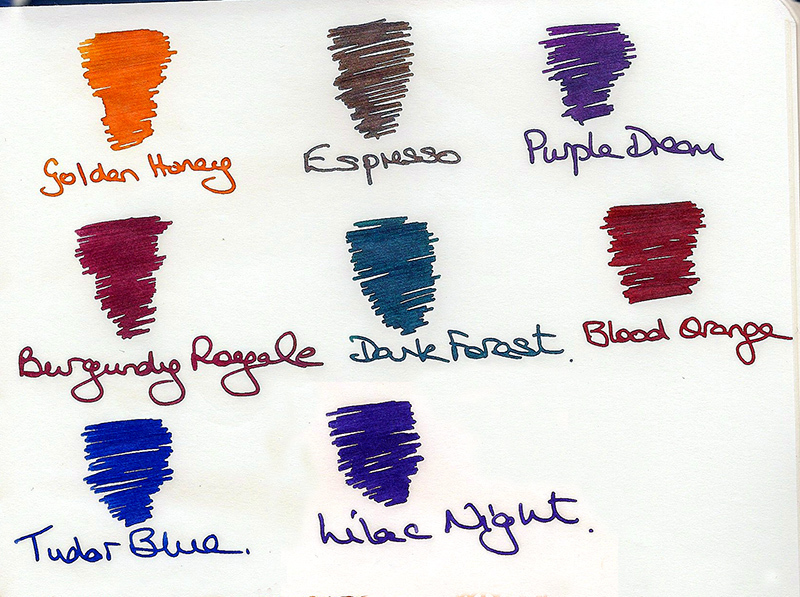 Diamine & Noodler's seem to be the front runners for blue ink, and Sailor when taking into account their exclusives. 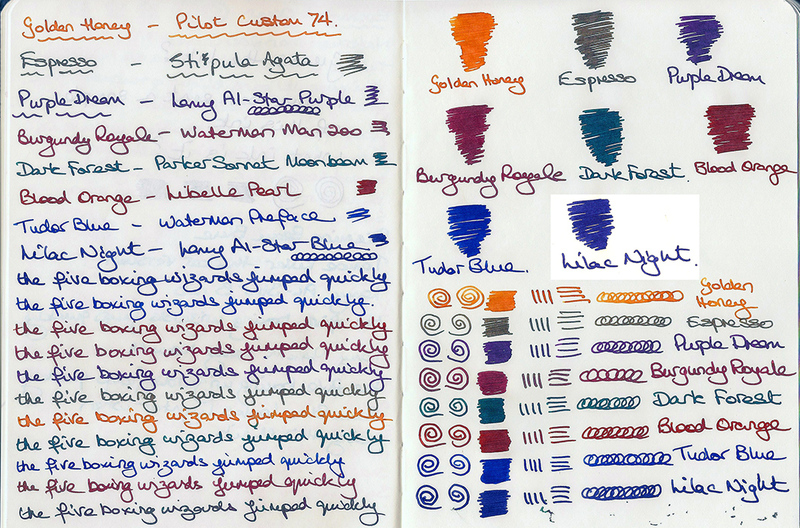 How does Tudor Blue compare to other blue inks? Eg Sapphire Blue and also maybe compared to Parker Penman Sapphire? I don't know why, but I thought of PPS when I saw these swatches. Thank you for posting! Mind you, Vis, you are going down the cyano-turquoise way! Blood Orange is a perfectly appropriate namesake for the fruit & will surely please many users. The Espresso is interesting enough for me to purchase a bottle; I trust you when you say it is "glitter free!" Thank you very much for being so forthcoming with these samples; we are an impatient lot & REALLY like to see what is going to be our next exciting ink to anticipate. No apologies necessary. As ever I appreciate your courtesy. My Surfing 101 professor said, "You can't ride every wave." Edited by Sandy1, 09 May 2017 - 23:48. Burgundy Royale, Golden Honey, Tudor Blue and perhaps Blood Orange - didn't expect that one. Any sign of them being available in the USA yet? I look forward to the full reviews. The Lilac and Purple are tempting me, the Burgundy might. 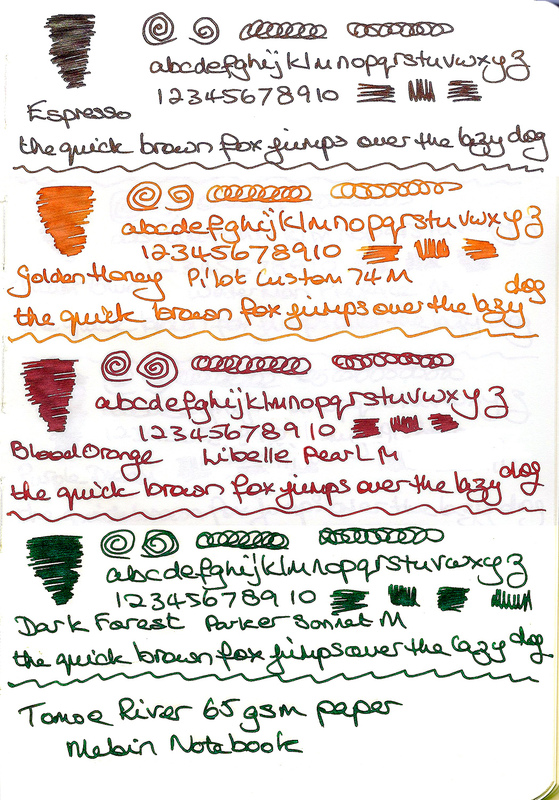 On Tomoe River paper I'm getting wonderful red sheen from Deep Forest plus a red halo effect from Golden Honey. I'll, try and photograph that. Diamine always ship to the US from their own web-site. However, these inks aren't 'available' anywhere yet. This is just a preview of some test samples. You're welcome. I'm also quite an impatient person so I completely understand.